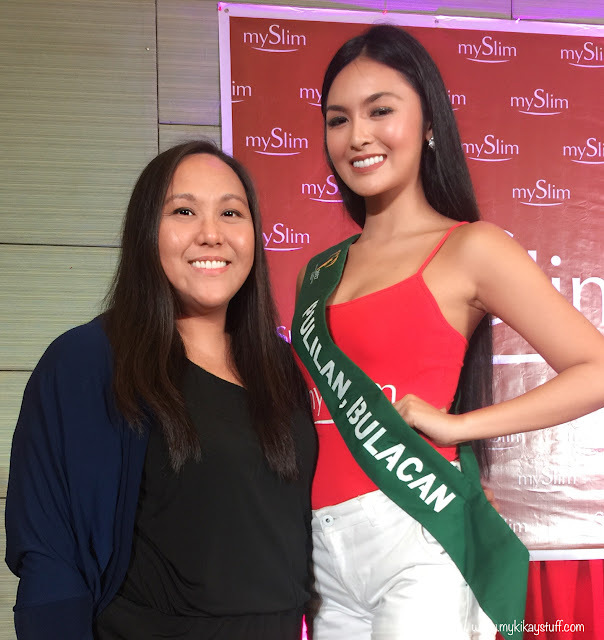 Vida Nutriscience, manufacturer of mySlim products, introduced ten of the forty candidates vying for the title of this year's Miss Philippines Earth to the media at the Luxent Hotel in Quezon City last Saturday, July 8, 2017. These young ladies were presented clad in casual tank tops and shorts showing off their beautiful physique as each of them took the stage. I can't help but admire the confidence and dedication that they put out there. I can only imagine how tough it must be to look your best the entire time. What's even more commendable is how they handle the pressure of answering difficult questions from the media and still remain composed. It's not surprising to find out that despite having attractive bodies, these towering beauties still commit to a healthy lifestyle. When asked about their secret in doing so, they revealed dedicating enough time to exercise and being mindful of their food choices. They were also bold enough to disclose using mySlim as a supplement to help maintain their sterling figure. Nowadays, with most people going for something instant rather than a healthy approach in achieving fitness goals, we tend to overlook the fact that instant results don't necessarily equate to long-term benefits. Good thing Vida Nutriscience came up with a natural supplement that works best with a sound and healthy lifestyle. As the name implies, mySlim is a slimming product that's proudly Filipino made and works optimally when coupled with a healthy lifestyle. It consists of three important components namely the Yerba Mate, Carnipure and Palatinose. Yerba Mate is a plant extract capable of reducing fat absorption without losing muscle mass. Combined with Carnipure and Palatinose, mySlim boosts the metabolism hence enabling you to maximize physical activities that ultimately leads to achieving a responsible and sustainable weight management. Myslim comes in two forms, the Detox and Fat Burner Drink and the Natural Fat Burner Complex Capsule. These are available in Mercury Drug nationwide or you may visit mySlim's Facebook page for more information on how to order online. Vida Nutriscience was also kind enough to give us samples of their products that I will be trying out very soon so please watch out for that. Towards the end of the program, we were given the privilege to take photos with the candidates and my heart was quickly captured by none other than Miss Philippines Earth candidate Samantha Viktoria Acosta from Pulilan, Bulacan. I can't wait to see her and the rest of the ladies compete during the coronation night on July 15, 2017 at the Mall of Asia Arena. How about you? Who do you think has a good chance of bringing home the crown? Let me know on the comments section below. Thank you for taking the time to read this post and see you on my next. Bye!